The leader of Felicity Party (SP), a small conservative party, said Thursday that they will not be joining the People's Alliance set up by the ruling Justice and Development Party (AK Party) and the Nationalist Movement Party (MHP). 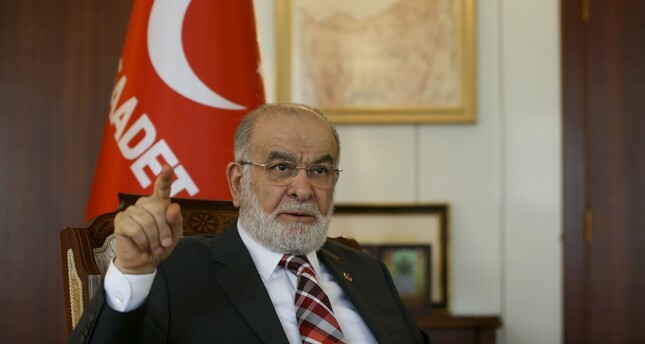 Speaking after a meeting with AK Party Istanbul deputy and Parliamentary Constitutional Committee head Mustafa Şentop, SP leader Temel Karamollaoğlu said joining the alliance is not on their agenda. Şentop did not make a statement following the meeting. It is known that Karamollaoğlu wants to determine the party's presidential candidate himself. Karamollaoğlu previously hinted at a possible alliance after holding a meeting with Erdoğan on Feb. 9. "We have not received any proposals for an alliance, but we can talk with anyone if need be," he said. As the crucial election in 2019 nears, small parties outside the parliament are preparing to negotiate for the best deal possible before time runs out and electoral alliances find a legal basis. The Great Union Party (BBP), a socially conservative nationalist party, has been in talks with the People's Alliance to join. BBP Chairman Mustafa Destici last week said: "An AK Party, MHP and BBP alliance will easily win the election with 55 or 60 percent of the vote and Turkey will be governed by a whole new system."